I first saw David Carson’s work, as did a number of others, in the short-lived magazine called Beach Culture, and I immediately wondered what the hell was going on. Who was reading this amazing magazine that seemed to be in the wrong place, directed at the wrong audience? It seemed to act like a popular mag, but sure didn’t look like one. Were surfers really into this radical design? Were they actually more savvy than I gave them credit for? Well, Southern California was the home of Kustom Kars and Low Riders, both examples of beautiful, radical, impractical design of and by the people. Maybe this was another step along those lines? Popular culture proving once again that it could be more revolutionary than high culture. Then Beach Culture disappeared and we never found out the answers. I was beginning to despair that rock music culture was becoming square, conservative, stuck. The mass-market mags were all towing some kind of party line, getting excited when they were suposed to, and narrowing their interests and focus until the world started becoming a suburban backyard. And that was what we were trying to escape from! Then along came Ray Gun, and hey, it’s that guy again! Now we’re talking. Design was cool again! Suddenly, visual expression was, as we always knew it was, as hip as Rock & Roll. Even the readers were contributing great drawings, paintings and sketches. This was not an isolated designer freaking out, but a catalyst for who knows how many people who knew that there is no difference between anything anymore-between “professional” musicians/artists and amateurs. For decades, public art programs have tried to “bring art to the people”; museums and great institutions of learning strive to “enlighten the masses”. When all along the “masses” have been doing it for themselves-maybe unrecognized, and in slightly different forms. With guitars and offset fanzines. With kustom kars, surfboards and skateboards. 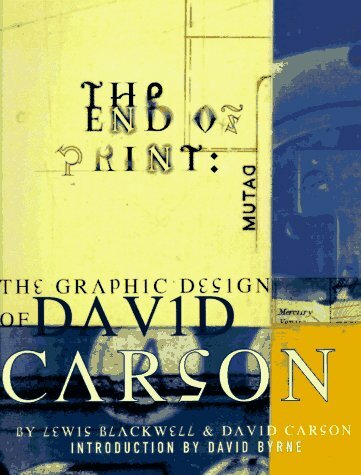 I suppose a lot will be made of David Carson’s work being the perfect example of Mcluhan’s theory of sprung life-that when a means of communication has outlived its relevance, it becomes a work of art. That print-books, magazines, news-papers will become icons, sculptures, textures-that they will be a means of communication of a different order, and that simple information transfer will be effected by some other (electronic) means. Print will no longer be obliged to simply carry the news. It will have been given (or will have taken, in this case) its freedom, and there is no going back. Print is reborn, resurrected, as something initially unrecognizable. It’s not really dead, it simply mutated into something else. David’s work communicates. But on a level beyond words. On a level that bypasses the logical, rational centers of the brain and goes straight to the part that understands without thinking. In this way it works just like music does-slipping in there before anyone has a chance to stop it at the border and ask for papers. — From the Introduction of End of Print by David Byrne (Carson, 1995).